The way John tells the story, Jesus doesn’t do “miracles”, he performs “signs”. Where are these signs pointing? 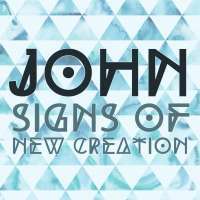 Each Sun-day, the sermon and classes will explore a different sign in John’s Gospel. On the cross, Jesus reveals the self-giving, self-sacrificing love of God. Even in the face of death, Jesus brings life. Some of the Pharisees near Jesus heard this and said, "Surely we are not blind, are we?" Jesus said to them, "If you were blind, you would not have sin. But now that you say, 'We see,' your sin remains." Christ draws near to his disciples and joins them on their journey to the other side of the lake. Making better choices to live life abundantly. Jesus invites his disciples to abundant life of both abiding in the divine love and bearing fruit of that love. “Abide and Go” is the rhythm and rhyme, sign and foretaste of the church’s relationship with God. Just when the party is about to screech to an embarrassing halt… Jesus keeps the whole thing going.